Recreating the classic style of the attic helm that originated in Attica, Greece, the Grecian Attic Helmet is a fantastic looking helmet that features an impressive and archaic look, despite the helmet style having lacked widespread use. This particular attic helmet features a rounded cap topped with a single, round-tipped spire. The helmet is uniquely shaped, featuring subtle curves, bends, and rises that give the helmet a decorative shape without ever adding any embossing or carvings. The helmet lacks a nose guard, which trades protection for uncluttered vision, although like many Greek styled helmets, it does feature hinged cheek guards for protecting the face. 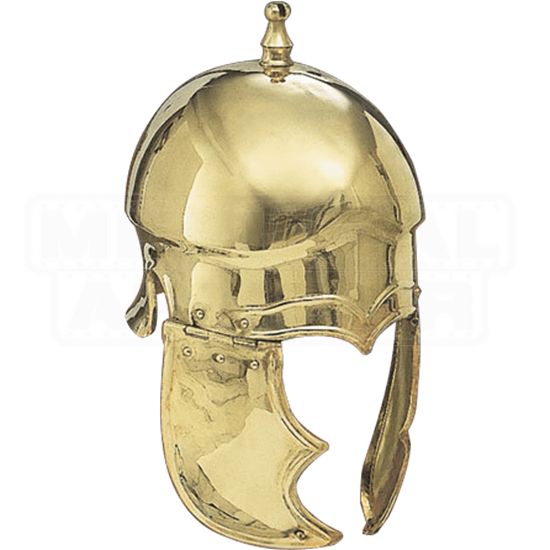 This helmet also features a classic and attractive polished brass finish that makes it look all the more ornate and stylish. Despite the attic style helmet not seeing immensely widespread use, it features a distinctive shape and look that makes the Grecian Attic Helmet a great addition to any Greek or Roman warrior who is looking for an archaic and grand appearance. And not only that, but it is sure to interest collectors and enthusiasts who love to get their hands on rare specimens from history.